Rehearsals on January 6 — just the third day of the Get Back/Let it Be sessions — deteriorated to the point where The Beatles were arguing about the very nature of rehearsals and the extent to which a song need be complete in order to have a member bring it to the full band to actually bother with run-throughs. With takes of “Two of Us” under way, Paul’s already defensive, George is already passive-aggressive. And John? Seems like he just wants to run out the clock and get the hell out of there. But at least he’s not showing any desire to have confrontation at this very specific moment in time. When we last left things, the song — while sounding great to these ears more than 40 years later — was hung up in the intro, outro and bridge (I guess that doesn’t leave a lot, does it?). Paul had just accused George of being annoyed by him and he bemoaned the presence of the cameras. After some silence and noodling by the group, and another remark by John about the opening riff that continues to torture him, Paul repeats his preferred rehearsal style. Paul: Doesn’t everyone agree that it’s confused at the moment? So all I’m trying to say is, let’s get the confusion, unconfuse it, then confuse it. Well, there’s another nice, little revelation. As of Jan. 6, it seems it’s locked in that the sessions will end Jan. 18 — or, if we’re adding in weekends, make it the 21st or 22nd (depending on whether the 6th counts against that 12 days). Presumably this is how long they’ve booked Twickenham. Talk about ambitious. As history would eventually prove, The Beatles would be out of Twickenham much earlier than that, on Jan. 14 – but that would be a direct result of George leaving the band before rejoining on a condition they abandoned the soundstage for Savile Row. After Paul’s repeated plea to simplify first, John jumps in, almost as comic relief, continuing his complete fixation on getting out of playing the opening galloping part on guitar. “I’ve got an idea,” John graciously offers. “I should vamp, because I’ve got to sing, and it’s hard going. But it’s annoying” (and he plays the opening riff). George fools around on guitar over a bit, making dialogue hard to pick up, until things get clearer in this next exchange. Paul: I’m trying to stop us all playing until we know what we are playing. George: But you got to play in order to find out which fits and what doesn’t. 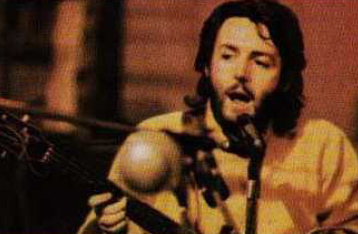 Paul: I’m thinking … we’re improvising the solos, but we play strict chords and strict rhythms around the vocals… I don’t want to say, ‘cause I really just hear myself the only one saying it. All this time…I don’t, don’t get any support or anything…you know its right, and you know its right. (He’s presumably talking to George and John). John: OK, so I just don’t know what to do about it. George: I’ll wait until you get your bits and then work my part out if you like. It’s like a matter of working it out with you while you’re working your bit out. You know if you got your bass bit, you know… it will take even longer. Paul: I’m not trying to say to you, you’re doing it again as though I’m trying to say, and what we said the other day, I’m not trying to get you. What I really am trying to just say is, “Look lads” — the band, you know — “should we try it like this,” you know? George: It’s funny now how I don’t even care. It’s amazing honesty from George. He, for one, doesn’t seem to care at all about the cameras capturing the proceedings. But alas, the tone he spoke in was somewhat mild (and who knows what the visual was) so I can see how this didn’t end up becoming the killer line chosen for the film, like “whatever it is that will please you” became. Meanwhile, Paul’s showing no hesitation in calling out George and John, both, in saying he’s alone in keeping things afloat. Really, for all of Paul’s flaws, he’s kind of right here about the situation. There does seem to be a bit of cart-before-the-horse when it comes to running through the songs. And as Paul continues, not skipping a beat after George’s dismissive comment, he goes back at George, reminding him of a recent exchange the two had over a song. More than 40 years later as I write this, it almost seems like “Hey Jude” was from a different generation of Beatles than the ones arguing their way through the Get Back/Let it Be sessions. But on Jan. 6, 1969, where we are today in this blog’s current timeline, it was a song recorded less than six months prior, released a little over four months earlier and had just dropped out of the UK Top 40 three weeks prior. It’s a funny thing how prevalent the ghost of “Hey Jude” was at the time of the Twickenham sessions. The song’s sessions were easy, with rehearsals beginning July 29, ending Aug, 1. The experience of the song’s video shoot – done at the same Twickenham — helped encourage the band that the time was right to perform in front of live audiences. And like these sessions, “Hey Jude” was ultimately recorded away from the safe and familiar confines of EMI Studios at Abbey Road (where they recorded what turned out to be more rehearsals than real takes), and instead at Trident. And if outtakes are any indication, it was a pretty upbeat affair. Thus, the experience recording the song — which happened smack in the middle of the White Album sessions — was fresh at the time of the Get Back/Let it Be sessions. Paul and George had just been discussing how much they liked Wilson Pickett’s cover version just three days prior. On “Hey Jude”, when we first sat down and I sang ‘Hey Jude…’, George went ‘nanu nanu’ on his guitar. I continued, ‘Don’t make it bad…’ and he replied ‘nanu nanu’. He was answering every line – and I said, ‘Whoa! Wait a minute now. I don’t think we want that. Maybe you’d come in with answering lines later. For now I think I should start it simply first.” He was going, ‘Oh yeah, OK, fine, fine.’ But it was getting a bit like that. He wasn’t into what I was saying. In a group it’s democratic and he didn’t have to listen to me, so I think he got pissed off with me coming on with ideas all the time. I think to his mind it was probably me trying to dominate. It wasn’t what I was trying to do – but that was how it seemed. This, for me, was eventually what was going to break The Beatles up. I started to feel it wasn’t a good idea to have ideas, whereas in the past I’d always done that in total innocence, even though I was maybe riding roughshod. I did want to insist that there shouldn’t be an answering guitar phrase in ‘Hey Jude’ – and that was important to me – but of course if you tell a guitarist that, and he’s not as keen on the idea as you are, it looks as if you’re knocking him out of the picture. I think that it was like, ‘Since when are you going to tell me what to play? I’m in The Beatles too.’ So I can see his point of view. What we see here is pretty obvious: The Get Back/Let it Be sessions have been tarnished — demonized even — in part, because we actually can hear everything that happens thanks to voluminous bootlegs. Good luck finding a recording George and Paul arguing over the “Hey Jude” extra guitar part. So in the Anthology excerpt (among other places, like in Barry Miles’ “Many Years From Now”), Paul does a pretty good job here giving what seems like an honest presentation of what was happening in 1968-69. And nearly 30 years after the fact , he was still able to run through the specifics. More from the “Two of Us” rehearsals, including George finally uttering that line I keep on going on about, coming up in the next post! – Had never read that quote before, that is great stuff. So perfectly encapsulates the reason they broke up in one sentence. Also, re John being non argumentative and seemingly just hanging out and chiming in here and there…..HEROIN. On the other hand, this stuff is probably best left to the imagination. Brilliantly fascinating. I don’t think George does say “…I don’t care” The clip is in the Anthology. It is really not clear what George is trying to say as Paul cuts him off it sounds like ‘It’s funny that I, it occurs though… um’. In Let IT Be, it always sounded to me like he said, “It’s funny that it occurs though only when the cameras are running.” Or something close to that. First off and most importantly, thanks everyone for reading. Such a pleasure to do, and even moreso knowing people are enjoying it. Or at least reading! @Craig: Really interesting line, right? Only recently got a hold of the Anthology book after all these years, and it’s a goldmine. Plenty of redundancies with the documentary, but also gems like that. And as far as John, you said it. @CW: I spent more time than I’m willing to admit trying to find something from that Hey Jude sessions, at least _something_ including the extra guitar part, but came up empty. And as for May 9 — if only there were reality shows back then! Would have been a classic. @Jimilast: Thanks for the nice words, it’s much appreciated! If you listen here — http://www.youtube.com/watch?v=SkOcCMdq3I0&feature=player_detailpage#t=979s — I’d swear I hear it as I laid it out. I keep praying every day for the Blu Ray of the film to come out (and rumors are this is the year). When it does, so much will be clearer for all! @odirony: Like I said in the response above (and in the post)– the movie’s sound is so muddy (at least the generations I’ve seen of it). I was going based on what I heard on the tapes, which are far from clear too. I never thought when I started blogging this I’d need to put on noise-canceling headphone and replay tiny bits of dialogue 100 times.